What is another word for colors? 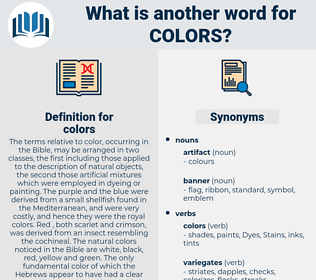 The terms relative to color, occurring in the Bible, may be arranged in two classes, the first including those applied to the description of natural objects, the second those artificial mixtures which were employed in dyeing or painting. The purple and the blue were derived from a small shellfish found in the Mediterranean, and were very costly, and hence they were the royal colors. Red , both scarlet and crimson, was derived from an insect resembling the cochineal. The natural colors noticed in the Bible are white, black, red, yellow and green. The only fundamental color of which the Hebrews appear to have had a clear conception was red ; and even this is not very often noticed. colourings, characteristics, clarifications, distinctions, contours, connotations, flavours, paints, persuasions, Pigments, hues, Lights, Subtleties, Dyes, overtones, Lotteries, refinements, images, Tastes, Stains, nuances, releases, actors, grades, looks, flushes, winners, abuses, walls, features, meanings, dividends, Bets, kinds, types, shades. And the old poet added these fine words: Poetry is like shot silk with many glancing colors. Six hundred were already with the colors.